Since I am going to an Elizabeth Gilbert reading event this evening, I thought it would be fitting to review one of her books. Eat, Pray, Love - One Woman's Search for Everything Across Italy, India and Indonesia. "By the time she turned thirty, Elizabeth Gilbert had everything a modern, educated, ambitious American woman was supposed to want - a husband, a house in the country, a successful career. But instead of feeling happy and fulfilled, she was consumed with panic, grief and confusion. She went through a divorce, a crushing depression, another failed love and the complete eradication of everything she ever thought she was supposed to be." "To recover from all of this, Gilbert took a radical step. In order to give herself the time and space to find out who she really was and what she really wanted, she got rid of her belongings, quit her job, left her loved ones behind and undertook a year-long journey around the world, all alone. 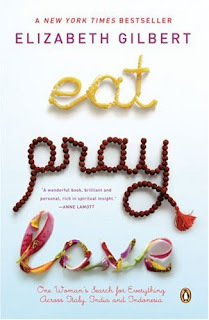 Eat, Pray, Love is the chronicle of that year. Gilbert's aim was to visit three places where she could examine one aspect of her own nature, set against the backdrop of a culture that has traditionally done that one thing very well. In Italy, she studied the art of pleasure, learning to speak Italian and gaining the twenty-three happiest pounds of her life. India was for the art of devotion, where, with the help of a native guru and a surprisingly wise Texan, she embarked on four months of austere spiritual exploration. Finally, in Indonesia, she sought her ultimate goal: balance - namely, how to somehow build a life of equilibrium between worldly enjoyment and divine transcendence. Looking for these answers on the island of Bali, she became the pupil of an elderly, ninth-generation medicine man and also fell in love in the very best way - unexpectedly." A memoir of self-discovery, Eat, Pray, Love is about what can happen when you claim responsibility for your own contentment. It is also about the adventures that can transpire when a woman stops trying to live in imitation of society's ideals. This is a story certain to touch anyone who has ever woken up to the unrelenting need for change." My Thoughts: For the most part, I enjoyed this book. Having never really been around divorce, I found reading about hers somewhat hard to relate to and emotionally draining, but I kept reading because of her writing. And because of the countries she traveled to over her year of starting over. Italy. Oh, how I am in love with Italy. I soaked in the third of the book that detailed her explorations of the country, the eating of the amazing cuisine and gelato, the kind friends she made, and I even learned a few new Italian words. Her humor and insight through these chapters is amazing. The middle section, India, I struggled to get through. It took me literally weeks to read this section. It was a difficult learning experience for Gilbert. Imagine living at an Ashram, learning Sanskrit, meditiation... then imagine reading about someone else doing it. India is where Gilbert had her big "ah-ha!" moment, but reading through it drained me. Indonesia started to pick up again. Her descriptions of Bali and the people she befriends are incredible - you want to be a part of it. There is romance, there is betrayal... It's exciting! At the very end, Gilbert updates us on the people we've gotten attached to through the book, which she also does on her website. Critiques: This book is not for the faint of heart. There are serious adult situations she deals with (a toxic divorce), language (in English and Italian! ), but the story as a whole is incredible. Look for the movie coming out this year starring Julia Roberts as Elizabeth Gilbert! 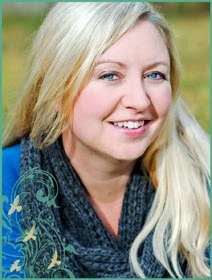 I hope to have some things to share with you tomorrow about the reading, and hopefully I will have met her! We'll see! There are still 5 days to be a part of my 100 Follower Contest! Have a great time tonight. I hope you do get to meet her! I've given you an award!!! Check it out here!! Hm, sounds interesting. I've seen this book on shelves, but have never bothered to pick it up before. thanks for the review on this--i've been interested in this book, but i'd heard such vague reviews on it. Thanks for the review - I'm reading this book right now for an online book club and love hearing about what other people think about it. Glad you got through it - I only have about 50 pages left, soooooo excited to get to the end so I can review it too. It'll be my first!